A no-cost alternative that I thought of was the grill that all refrigerators have. 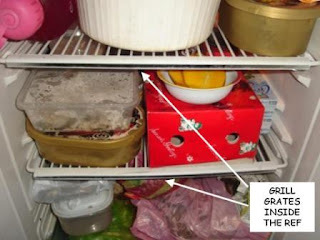 Most refrigerators have 2 pieces of these grills that function as 2 levels of shelving for foodstuff. Some of these grills are made of aluminum alloy and some are iron but with a plastic insulation. We had an old refrigerator that had the latter type of a grill. We decided to sell this old refrigerator to a junk dealer. And before we did, we removed some salvageable materials. It had 2 plastic-insulated grills. Here’s one of them. Since the superkalan isn’t a big cooker, half of the size of this grill is enough for use. So I used a hacksaw to cut the rods that make up the grill. And just like that, we have 2 grills. But you only need one for current use so store away the one of these two. The plastic insulation will protect this storeaway piece from rusting. We’re not through yet though since the piece we’ll use has plastic insulation. So I used a cutter to splice off the insulation. This could be a long tedious process. The insulation around the corners and joints where the rods meet is even more difficult to remove so apply extreme caution when using the cutter. With enough cuts around the corners and joints, use your thumb and fingers to peel off the plastic. On hindsight, I suppose I could’ve just burned the plastic off by simply putting the grill on the fire. But that would be messy and not too environmentally friendly. Be sure to remove all remaining plastic on the grill. Run your fingers on the grill rods to feel for any leftover plastic and scratch them off with your fingernails. Here’s the spliced clean grill. Scrub with soap and water and you’re ready to grill. To celebrate this successful yet simple DIY project, let’s grill some hotdogs!